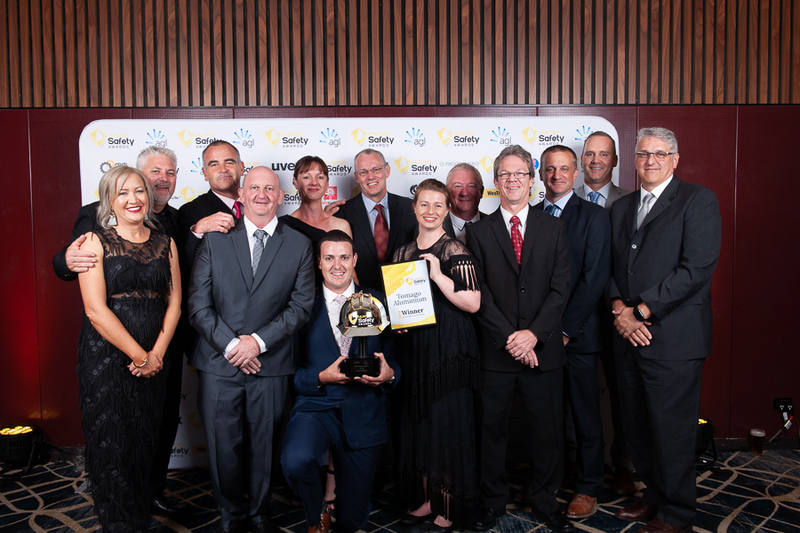 Tomago Aluminium has taken out the region’s most prestigious safety award, the ‘Gold’ Safety Helmet for WHS Business of the Year Award at the 2019 Hunter Safety Awards. Now in its fourth year, the Awards acknowledged businesses in the Hunter that demonstrated best practice and innovative approaches to workplace health and safety at a gala event at NEX in Newcastle on Friday, 15 March 2019. Hunter Safety Awards Founder, Sarah-Jane Dunford, said Tomago Aluminium’s ingrained workplace health and safety principles made it a stand-out leader with an enviable record. “Tomago Aluminium’s key philosophy behind its workplace health and safety program is ‘Mates Looking after Mates’ which encourages employees to speak up if they see a mate at risk,” she said. Tomago Aluminium People, Safety and Environment Manager, Simon Mitchell, said it was a great honour to be recognised as WHS Business of the Year. “As an employer of over one thousand staff and contractors, we are constantly looking for ways to improve systems and processes to ensure every person is safe at work,” Simon said. Central to the continued roll-out of the program was the recent development of the ‘Coming Home’ resource, a powerful video featuring current and past Tomago employees who have been involved in workplace incidents. A number of other initiatives supported the film. These included programs to improve mental health awareness and support networks, practical adult based learning on risk normalisation and complacency, health and wellbeing promotions, leadership development and the commitment of the health and safety committee members and the leaders in the business. “We are all very proud of the work done across all levels of the organisation to create an interdependent culture where everyone is looking out for each other and seek ways to continuously improve.” Simon said. The WHS Champion of the Year, sponsored by the University of Newcastle, was presented to Tony Melia, Operations Manager at Alspec Newcastle Branch. Tony was acknowledged for his leadership of an active safety committee that has regularly implemented new strategies and initiatives to drive safety in the business. Lauren Meldrum was awarded Young WHS Leader of the Year, sponsored by uvex. Lauren has been instrumental in building a positive workplace culture at Reliance Hexham, resulting in increased understanding in the importance of health and safety and a more engaged workforce. Westrac sponsored the award for Most Innovative WHS Idea (large organisation), which was presented to Australia Post, while Most Innovative WHS Idea (small to medium enterprise), presented by 3M, was awarded to Muru Management Consulting. Best WHS Management System (large organisation) was awarded to Novaskill (sponsored by Red Insight), with Carter Heavy Haulage taking out the MRS Services Group-sponsored Best WHS Management System (small to medium enterprise). Improvement in WHS was highlighted with Hume Doors & Timber acknowledged as the best large organisation (sponsored by Sonic Health Plus), with Reliance Hexham taking out the SME category, sponsored by Jason Reading Landscapes. ACI Global sponsored the award for the newly introduced Best Health & Wellbeing Program, which went to Murray Consulting. Christopher Layzel, People, Safety, Environment and Quality Manager at Brimble Rail, was named the AGL WHS Student of the Year for his passion to inspire future safety leaders to combine their passion for WHS with an educational Journey. Christopher is currently studying for a Masters in Workplace Health and Safety (Risk Management) and a Graduate Certificate in Business Administration. Rounding out the awards, Asset Training was acknowledged with the award for Best WHS Training Course, sponsored by Programmed Skilled Workforce. Launched in 2016, the Hunter Safety Awards were developed to highlight and acknowledge companies and individuals within the Hunter region who are demonstrating best-practice and innovative approaches when it comes to workplace health and safety. IMAGE | Tomago Aluminium with Sarah-Jane Dunford (Hunter Safety Awards) and Len McLachlan (AGL).